Looks like tickets are available for multiple times on 7/29 and 7/30. DRESS CODE: SINCE THIS IS THE DAYTIME VERSION OF THE SHOW PLEASE EVERYONE WEAR BRIGHT COLORS, NO HATS AND NO LOGOS!!! 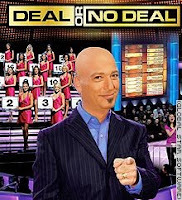 The hit game show DEAL OR NO DEAL is hosted by the versatile comic, Howie Mandel. If your Child is 14 or 15 please choose the 16 or older option when selecting your childs age. Our system will not submit your request if you don't. Click (here) for more info on how to get tickets. 0 Response to "Free Deal or No Deal Tickets - 7/29 & 7/30"